A decadent dessert, that's wholesome enough to eat for breakfast, this easy chocolate chia pudding comes together in about a minute from just a handful of ingredients. 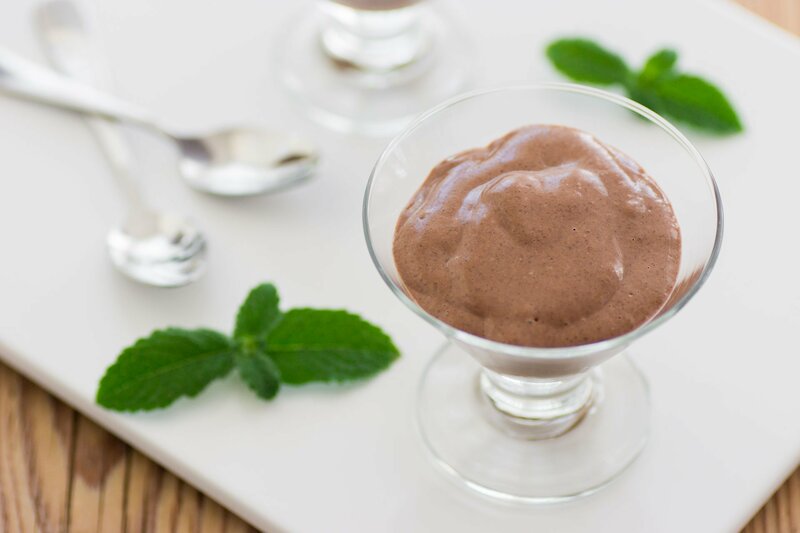 Made with coconut milk, cocoa powder, and chia seeds, this pudding is so rich and creamy, no one will guess that it's plant-based. Any non-dairy milk will work (or even a dairy milk if you’re not vegan), but I like using coconut milk because it’s very rich, and has a mild sweetness that allows you to cut back on the amount of sugar you need to add to the pudding. My original vegan chocolate chia pudding recipe used maple syrup as the sweetener, but lately, I’ve been using coconut sugar. Maple syrup gives the pudding a bit of a maple taste (which isn’t necessarily a bad thing), but coconut sugar lends a caramelized flavor that makes this taste a bit like malted milk. Given my affinity for anything with malted milk, the choice is a no-brainer. As for the amount of sugar, coconut milk is naturally sweet, which is why I don’t add a ton of sugar. 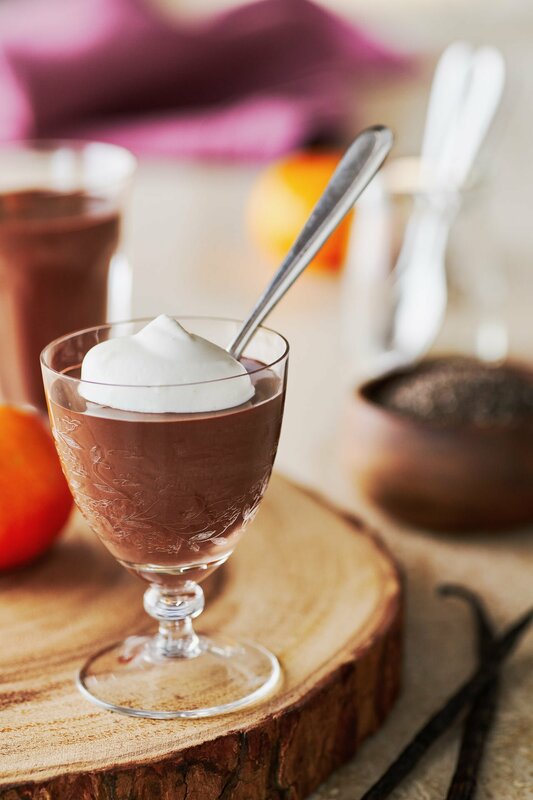 This makes for a bitter-sweet chocolate pudding that has a grown-up taste. If you prefer something sweeter, feel free to add another tablespoon of sugar. For most food products I prefer the ingredients to be as natural and unprocessed as possible, but chocolate is one of those foods that wouldn’t be chocolate if it were not processed. Cocoa powder is made by fermenting, drying, and roasting the seeds of the cacao fruit. Then the oil is extracted from the seeds (which is cocoa butter), and the remaining pulp is ground into a powder. This is known as “natural” cocoa powder, and it has a reddish brown color and is slightly acidic. Dutch-processed cocoa powder goes one step further and uses an alkali to balance the pH of the cocoa powder. This not only makes the cocoa powder less tart, it imparts a deep brown hue while making it taste more chocolatey. That’s why I recommend using Dutch-processed cocoa powder for this pudding. 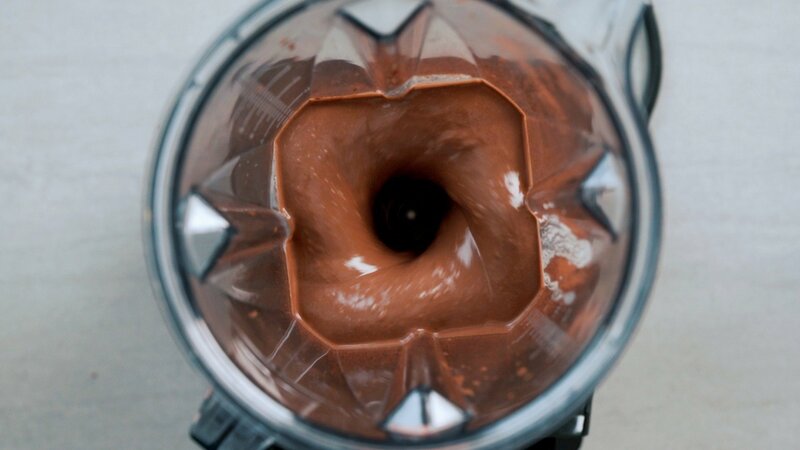 For reference, the photo above is of a previous batch I made using the same amount of natural cocoa powder. The color and taste just aren’t the same. Cocoa, like coffee, has different flavors depending on where the cocoa comes from and how it was processed, so different brands tend to have different tastes. My personal favorite is Valrhona, and is what I used to make this recipe. 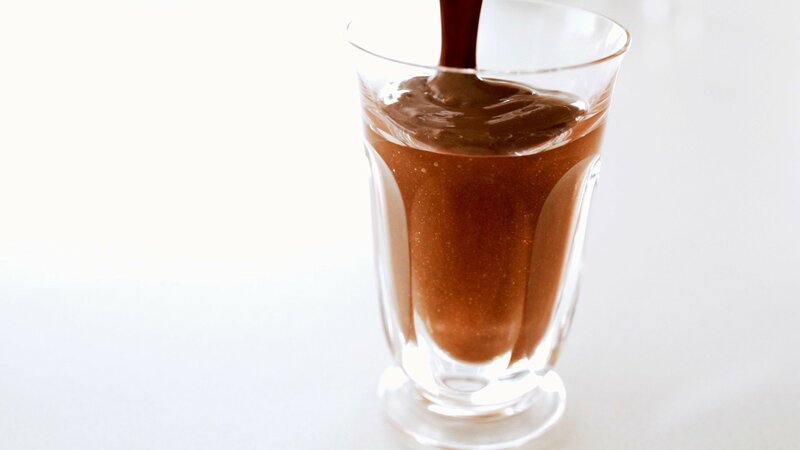 So far we have the makings of a really delicious plant-based chocolate milkshake, but it takes the addition of this magical ingredient to turn it into a pudding. Chia seeds are the seed of a plant in the mint family and are native to Central America. The seeds are hydrophilic (i.e., they love water), and can absorb 12 times their weight in water! That’s because they contain a compound that forms a gel when soaked in water. This gel is what’s able to thicken the pudding without adding any starch or eggs. Most chia seed pudding recipes just have you mix the whole seeds in with the liquid ingredients, but I like to grind the seeds up for a couple of reasons. Not everyone loves the slimy texture of chia seeds, and by grinding them up into a powder, you can harness their ability to gel, without the mucilaginous texture. The second reason is that the gel coating on the whole seeds helps them slip right through your digestive tract intact. This means your body isn’t able to absorb all the nutrients that this superfood has become famous for. Grinding them up allows your body to take advantage of all the fiber, protein, vitamins and minerals contained in every seed. To get the creamiest chocolate chia pudding possible, I grind the seeds in a coffee grinder first. If you don’t have a coffee grinder, you can spin the chia seeds in the blender before adding the other ingredients, but they don’t get ground quite a finely as in a coffee grinder. Then you just toss the ground chia seeds into a high-speed blender, along with the other ingredients. I use a Vitamix Vita Prep 3. It’s the commercial model which has a powerful 3 horsepower motor, but the home models should work fine as the blades spin at the same rate. With blade speeds in excess of 22,000 RPM, these things will obliterate skin, seeds, and fibers, making smooth purees out of just about anything. 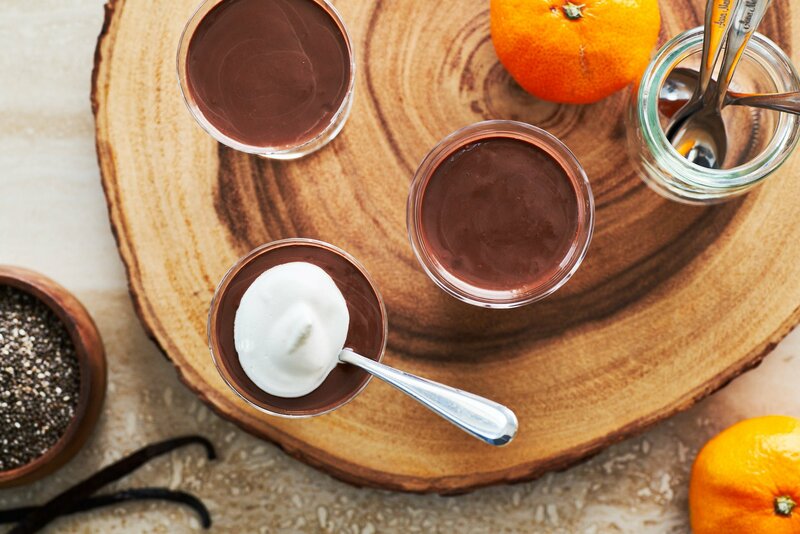 This vegan chocolate pudding is one of those unique desserts that gets better with age. When it’s first made, it has the consistency of yogurt, which makes it perfect for saucing a banana and chocolate granola breakfast bowl. Leave it in the fridge for a day, and it will thicken to the consistency of smooth chocolate pudding. This makes for an indulgent dessert on its own, but topping it with a dollop of whipped coconut cream takes it to the next level. 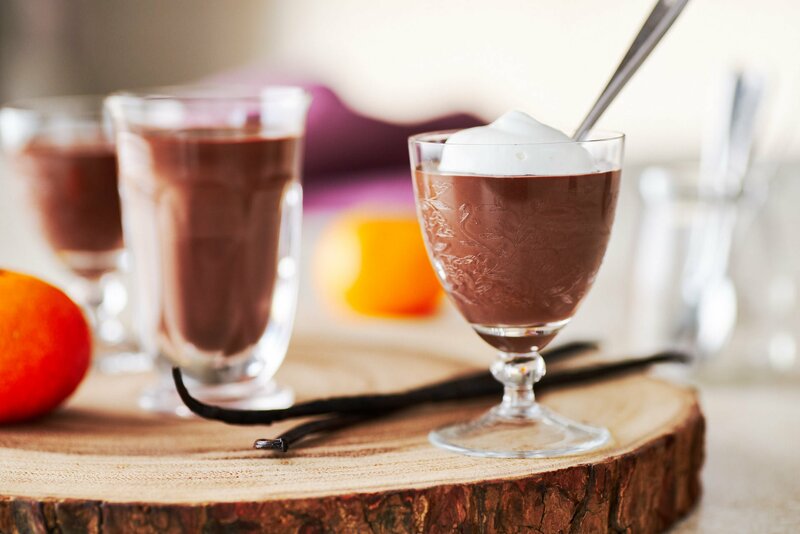 Finally, if you somehow manage not to eat all of it in the first two days, the pudding really sets up, giving it the texture of a mousse or pot de creme. The possibilities here are endless, and it would be great spread between layers of a cake, or it could be poured into a tart shell to make a chocolate cheesecake. How would you eat this magical minute pudding? Let me know in the comments! 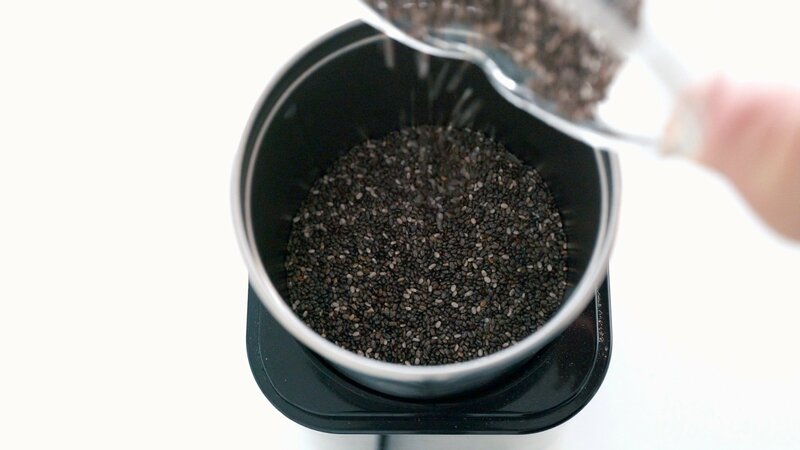 Put the chia seeds in a clean coffee grinder and grind into a powder. Add the ground chia seeds, cocoa powder, coconut sugar, coconut milk, and vanilla extract to a high-speed blender and blend until smooth. Love it, I didn’t know the chia seed could be turn into powder. Excellent idea!!!! Hi Vivy, whether you use them whole, or ground into a powder, chia seeds make for a great room temperature gelling agent. I also use chia seed powder to thicken my salad dressings without adding any oil (just be careful not to add too much or it will get too thick to pour).